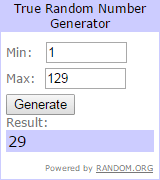 Out of the 129 comments left on my Jaftex 85th Anniversary Celebration post (where I revealed Prismatic Rainbow, a quilt made from the above 20 piece fat quarter bundle of Fusion Illusion fabric from Blank quilting), the random number generator selected comment 29. Congratulations Melody L., I will be in touch to get your shipping address so I can get these lovely fabrics out to you! In general, I have a few updates to share. I was able to donate 15 inches of my hair to Beautiful Lengths by Pantene. The wigs made from donated hair to Beautiful Lengths are given to women suffering from hair loss from cancer. I am still adjusting to my now very short haircut. My husband and I just got back from a long vacation. Did you miss me? I worked very hard over the summer to have enough content to have a nice grouping of scheduled blog posts while I was away. I guess I am a bit paranoid about the internet knowing I am not at home. While we were away, I had a birthday. 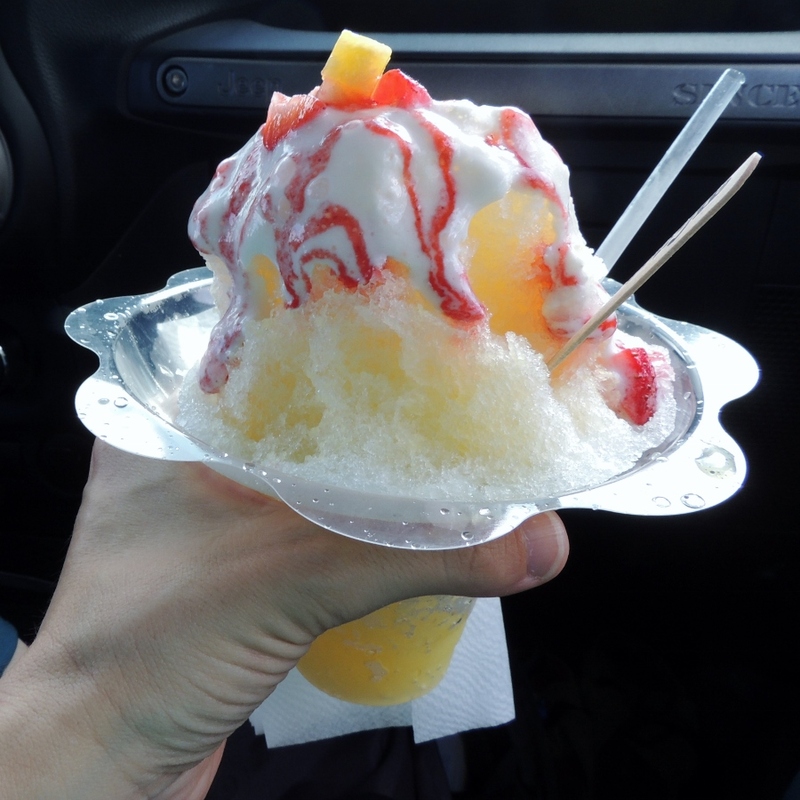 To celebrate, I had a shaved ice (flavor: tiger’s blood) the size of my head, and it was great! I actually had an opportunity to sample 9 different shaved ice while I was on vacation. Yum! I got to view lots of rainbows, which made my heart full and happy. The wildlife was fun to watch and photograph. And the ocean life was a treat. I don’t have any more posts scheduled… so I guess I need to sit down at my sewing machine! I sketched out almost 20 quilt designs that I am pretty excited about. Nothing beats a day on the beach with dot grid paper and a pencil. Your new hair style looks so professional! You look ready to go out and take the quilting world for a spin. Go for it! I never heard the shaved ice term but it does look good 🙂 Great pics! I’m also curious where have you been? Your generosity of donating your hair will indeed help to make someone else feel normal in while going through a hard time in their lives. I love all your pictures of various rainbows. I can hardly wait to see what you designs you have created. Congrats on donating your hair! I did that many years ago and I think it is a wonderful cause. I remember how hard it was to get used to the shorter length, but it looks really cute! 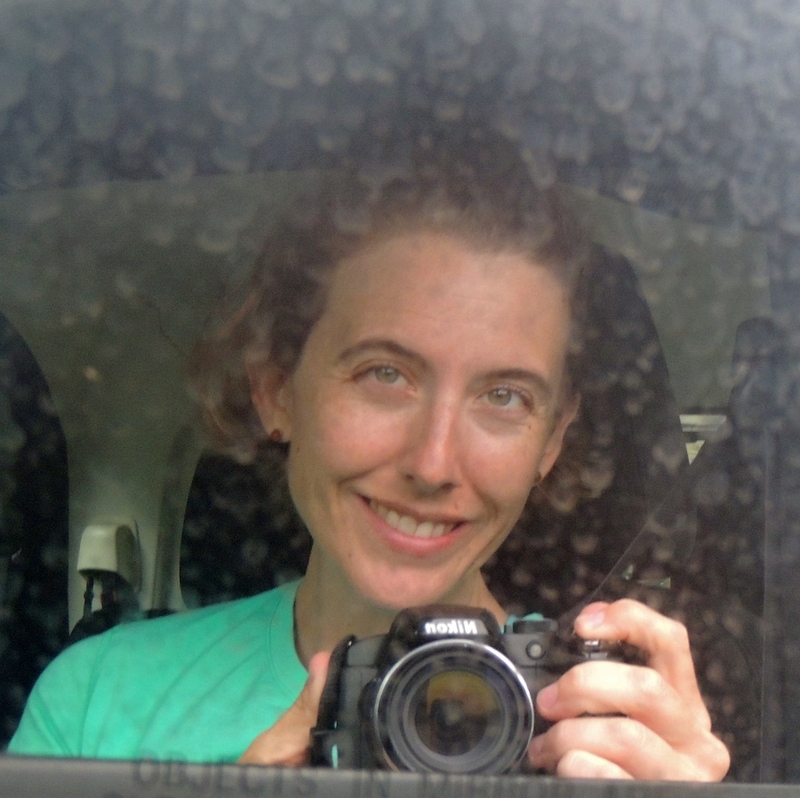 Your photos are gorgeous, they look like some of my Hawaii photos from several months back. Look at how wavy your hair is. We couldn’t tell that in your old picks. It looks like you had a wonderful vacation by your photos. I didn’t miss you at all because you seemed like you were right there with all those scheduled posts. Your new hairdo is great, so nice of you to help someone going though a tough time. Sounds and looks like your vacation was relaxing and productive. Thanks for sharing. I think the haircut looks wonderful on you. Love those wildlife pics. Oh, and that first photo of you is definitely “profile” worthy!!!! So pretty!! There is nothing better than a vacation! I’m sure it was amazing for you and your husband! Your hair looks great Yvonne! Donating it to a worthy cause…wonderful! I’m sure you came up with some amazing sketches, which I hope you share soon! Looks like you had a great vacation! I totally agree about not telling the whole interwebs when you’re away. Can’t wait to see what you designed at the beach! Congratulations Melody! You are a lucky one!!! Yvonne, your short hair is beautiful! Someone will be so appreciative of your gift of love. I think the lava flow ice is amazing! What flavor was tiger’s blood? What fun, and belated happy birthday! What a wonderful vacation—awesome rainbows, scenery and sea creatures—thanks for sharing!!! I think your hair is adorable! Those pictures certainly reflect a lovely place. Making memories, good stuff! Happy Birthday. Your shorter hair looks so nice and donating to an organization that helps cancer victims is very generous. It took a long time to get it that long. Did you get a brain freeze from the ice dessert. I always do. Your short hair is so spunky and fun! And it looks like you’ve been in Hawaii! Did you try red beans in the bottom of your shave ice? They are sweet, not like black or pinto beans. If you didn’t, you’ll just have to go back and try it. Welcome home. I really like your new hairstyle! Wonderful donation, myself and several other friends and family have donated our hair also. Love your pictures, you did a great job on these. Thanks for sharing and have a wonderful creative day! Your shorter hair looks great! Ahh, la mer….something about it in French sounds better than “the beach” although that definitely has a pleasant sound too! Love all your wildlife and rainbow shots. Looking forward to seeing your new designs! As I mentioned on fb, I love your selfie photo, you’re just gorgeous! 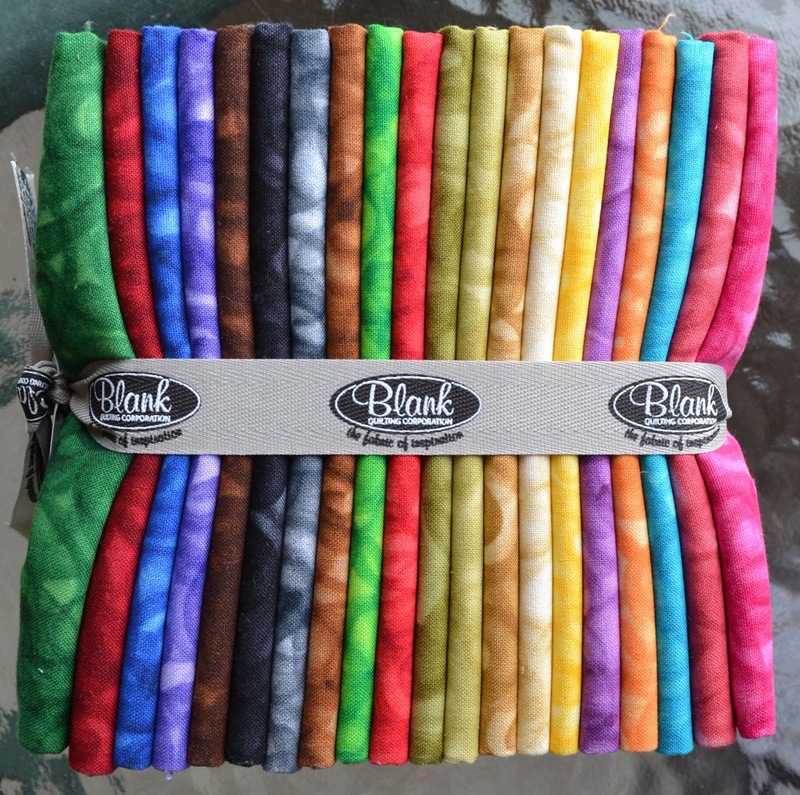 Congrats to your fabric winner (I’m a little envious!) and excited to see what comes of your vacation sketches. I think the short hair suits you well, and as everyone said, it’s for such a great cause! I didn’t realize you’d been gone, but I’m glad you had fun. I’m also impressed with how many blogs you had pre-written. I’m just trying to keep up with WIP Wednesdays at this point! Your vacation looks like it was fabulous – yay for shaved ice! I love your new do, it looks so great! Love, love, love your new haircut. It is super cute on you! And wow on the shaved ice. I have never seen one quite that big. Hope you enjoyed it! Of course I missed you! Your scheduled posts were only a thin veil to the reality of your absence. Actually, they posted quite smoothly, and I was really impressed with how seamless you had them all lined up! And I’m not sure it is fair to say I missed you more because you were further away because your communication was above what I expected. I have never had a shaved ice on the scale of the ones pictured! I’m sure what I’ve had was more like a sno cone…and wouldn’t make me want to try 9 different flavors, so that probably says a lot about what a sno cone is like. I love looking through all of your photos! What a gorgeous vacation! Your hair looks fabulous. I know what it feels like to adjust to shorter hair. I went shorter a few months ago, and it took me a bit to adjust, but I love it now. Guess I need a new profile pic. Glad to hear you had a great vacation. Your new “do” looks incredible. Funny how such a thing as a haircut can change the way someone looks. I really like it. Vacation sounded like fun. I had a holiday and a birthday too, which is why I have been so quiet. It looks like you had a great trip in some beautiful spots. Were you diving or snorkelling? 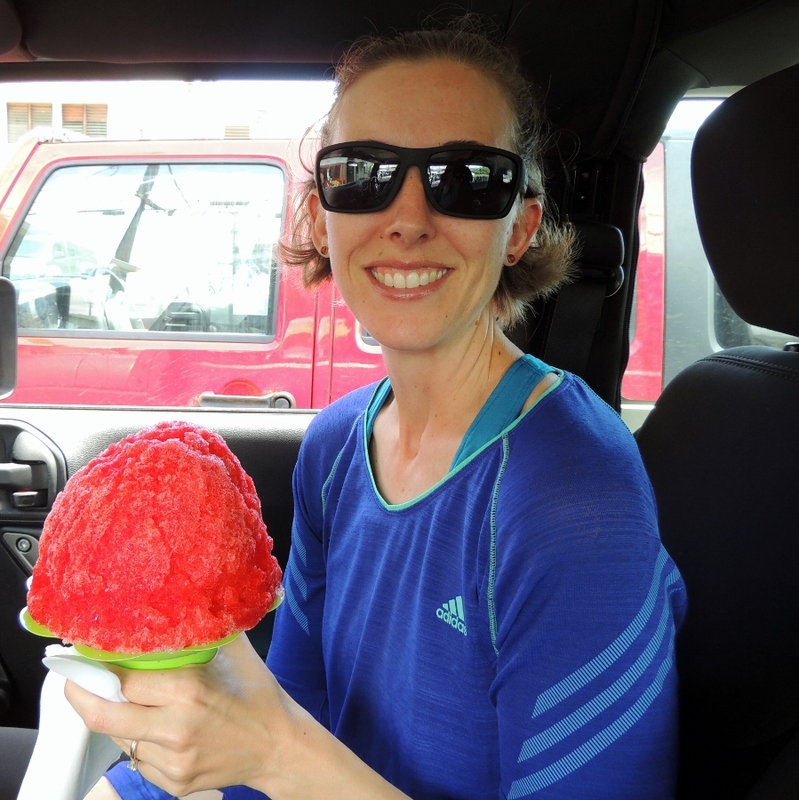 I have never eaten a shaved ice, let alone one as big as my head!